On Friday, February 9, 2018, Congress passed, and the President signed, the Bipartisan Budget Act of 2018 (the “Budget Act”). The Budget Act contains a number of provisions that affect qualified retirement plans. 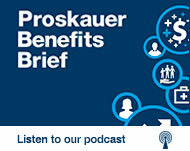 Plan sponsors should consider the impact of the Budget Act on their retirement programs. First, the Budget Act eliminates the requirement that a participant exhaust the opportunity to take loans under the plan before receiving a hardship withdrawal. Second, the Budget Act allows a participant to take a hardship withdrawal from the participant’s elective deferral contributions, qualified nonelective contributions (“QNECs”), and qualified matching contributions (“QMACs”), as well as from earnings on each of those contribution sources. Prior to the Budget Act, a participant could take a hardship withdrawal from elective deferral contributions but not from QNECs or QMACs nor from earnings on any of those deferrals or contributions. Third, the Budget Act directs the Secretary of the Treasury to modify existing 401(k) regulations to the remove the rule prohibiting participants from making elective deferrals and other employee contributions to the plan from which the hardship withdrawal was taken and any other plans maintained by the employer (which includes other qualified retirement plans, 403(b) plans, and nonqualified deferred compensation plans) during the six-month period after taking a hardship withdrawal. The guidance likely will also address what happens to participants who otherwise might be in the middle of a six-month contribution suspension period once the new rule eliminating that suspension becomes effective. Finally, it is noteworthy to consider the potential impact of this new rule on nonqualified deferred compensation plans subject to Code Section 409A. Under the Section 409A regulations a nonqualified deferred compensation plan is allowed to cancel a participant’s deferral election following a 401(k) hardship distribution (as well as an unforeseeable emergency distribution under the deferred compensation plan). Employers should consider whether they wish to continue the practice of cancelling deferred compensation plan deferrals after a 401(k) plan hardship distribution once the new 401(k) rule is in place. California Wildfire Relief. The Budget Act contains special disaster-related rules for the use of retirement funds by an individual whose principal place of residence was in a Presidentially-declared California wildfire disaster area between October 8, 2017, and December 31, 2017, and who incurred an economic loss due to the wildfires (a “Qualified Individual”). This relief is similar to what was enacted last year for the victims of Hurricanes Harvey, Irma and Maria in 2017 as part of the Disaster Tax Relief and Airport and Airway Extension Act of 2017 (enacted on September 29, 2017) and also relief that was included in the Tax Cuts and Jobs Act for plan participants residing in Presidentially-declared disaster areas in 2016 (enacted on December 22, 2017). Plans are not required to offer this special disaster relief. Plan sponsors who wish to offer this relief to participants impacted by the California wildfires may do so immediately, but their plan document must be amended to conform the terms of the plan to the plan’s operation. The deadline for amending plans for this relief is the last day of the first plan year beginning on or after January 1, 2019 (i.e., December 31, 2019 for a calendar year plan). A Qualified Individual can take a qualified wildfire distribution of up to $100,000. Qualified wildfire distributions are not subject to the 10% early withdrawal penalty, can be recontributed over a three-year period, and will be included in the participant‘s income ratably over three-years unless the participant elects otherwise. The Budget Act increases the loan amount that a Qualified Individual can take from his account under a qualified retirement plan to the lesser of $100,000 or the full amount of the individual’s vested account balance. Qualified Individuals who have loans outstanding are permitted to delay loan repayments for up to one year. A participant who took a distribution after March 31, 2017, and before January 15, 2018, to purchase or construct a home in the area where the California wildfires occurred is permitted to repay such distribution if the participant was unable to actually purchase or construct the home due to the California wildfires. Such repayment must occur no later than June 30, 2018. Wrongful IRS Levy. If an amount was withdrawn from an IRA or an employer-sponsored retirement plan due to an IRS levy that was later determined to be wrongful, the Budget Act permits the affected individual to recontribute the amount returned (including interest) as a result of the wrongful levy. This provision is effective with respect to “amounts paid” after December 31, 2017, but it is not entirely clear whether this relates to the date that the wrongfully levied amounts were paid from an IRA or plan or the date that the amounts were returned to the affected individual. Multiemployer Pension Plan Committee. To assist in addressing the funding and solvency issues faced by many multiemployer pension plans and the Pension Benefit Guarantee Corporation, the Budget Act establishes the “Joint Select Committee on Solvency of Multiemployer Pension Plans.” This committee is tasked with providing recommendations and legislative language by the end of November 2018 that will “significantly improve multiemployer pension plans and the Pension Benefit Guarantee Corporation.” The bipartisan committee will be composed of 16 members, appointed by party leaders, with an equal number of members from the Senate and the House of Representatives. The co-chairs of the committee must be named by party leadership no later than February 23rd.